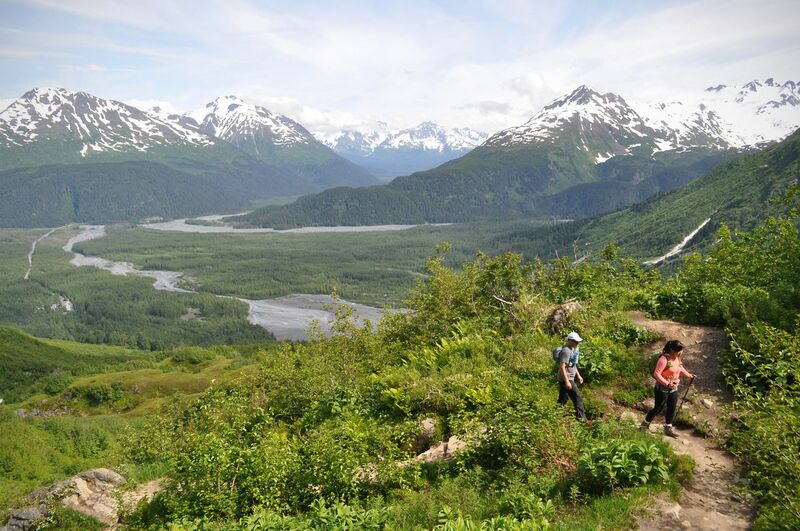 Hikers are spoiled for options in Alaska. From quick jaunts to multiday hikes, there's no shortage of trail options. While only some hikes demand special equipment, like crampons for a glacier trek or a stove for overnight ventures, there are other items you need every time. Here are some of the essentials. Good shoes: If you're doing a fairly flat or paved trail, you can probably get by with trail running shoes. If you're on a hike with multiple creek crossings, muddy trails or scree, you may spend more time missing the ankle support and waterproofing powers of your hiking boots than you'll spend actually enjoying the nature. Layers: Even the most beautiful bluebird day can devolve into a downpour of rain. Be sure to bring moisture-wicking base layers, an insulating layer and a waterproof outer layer to keep you dry and cozy. Bear protection: Did you know an estimated 30,000 brown bears and 100,000 black bears are spread throughout Alaska? While bear attacks are rare, it's always a good idea to carry bear spray in an accessible spot (and to know how to use it). Water: Staying hydrated while hiking is essential for both performance and general survival, so if you can't carry the amount you need for your trip, bring a filter or purifying tablets to cleanse the water you find along the way. Clear flowing water, like streams, is usually a better, safer water source than stagnant bodies of water, such as lakes and ponds. Map: Cellphone coverage is a rare gift in Alaska's backcountry, so don't plan on relying on your cell service to pull up GPS maps. Even busier trails in the city can be out of range. If you're going to use your phone, download a topographic map before you head out. Otherwise, print maps of your desired trail (plus a few miles more of the surrounding area, in case you accidentally wander too far off the map) or pick one up at stores like Alaska Geographic and REI. Consider these nature's rules of the road. 1. Don't cut switchbacks — when done repeatedly in high-traffic areas, it can lead to erosion. 2. If you stop for a water break or to take a picture, move to the side of the trail so others can get by easily. 3. Give hikers moving uphill the right of way — they're working harder than those going downhill. 4. Pack out what you pack in — don't leave empty bottles, food wrappers or toilet paper in the woods. Why would you want to destroy the nature you're out here to see? 5. Be mindful of noise pollution. Many people go out into the woods to get away from city noise and to enjoy the sounds of nature, so avoid blasting music on speakers. That being said, consider wearing a bear bell to warn the other mammals in the park that you're coming — you don't want to catch them by surprise. Generally speaking, neither bears nor moose want anything to do with you. Try to make noise when you're on the trails — talking, clapping or singing are all good signals that are people coming. If you're making enough noise that animals can hear your approach and travel slowly enough that they have time to move, you might not even see them. Alaska's Department of Fish and Game has some good resources about what to do in case of a close encounter. Here are some general pointers. Bears: Give the bear plenty of space and remain calm. If it appears that the bear hasn't seen you, move away slowly, never taking your eyes off the bear. If it has seen you, face the bear, stand your ground and talk to it in a normal voice so it recognizes you as a human. Try to seem bigger by standing near others in your group or putting your arms above your head. If the bear comes toward you, raise your voice, throw rocks or sticks and use a deterrent like bear spray if you have it. Don't try to outrun the bear — you can't, and running will trigger the animal's prey drive, causing it to chase you instinctively. In the very unlikely event that you are attacked, either play dead or fight back. To play dead, lie as still as possible on your stomach and protect the back of your neck with your hands. If the bear no longer feels you're a threat, it will most likely leave. Stay motionless as long as you're able. If the bear sees you moving again, it may renew its attack. To read up more on the topic, see the Alaska Department of Fish and Game's guide: "The Essentials for Traveling in Alaska's Bear Country." Moose: Like bears, moose aren't usually aggressive unless they're provoked. Unlike bears, if one is charging, you should run — a bull moose can weight over 1,400 pounds, which can do some serious damage. Get behind a tree, car, fence, or put some kind of sturdy object or structure between you and the moose. Bailey Berg is a freelance writer in Anchorage.